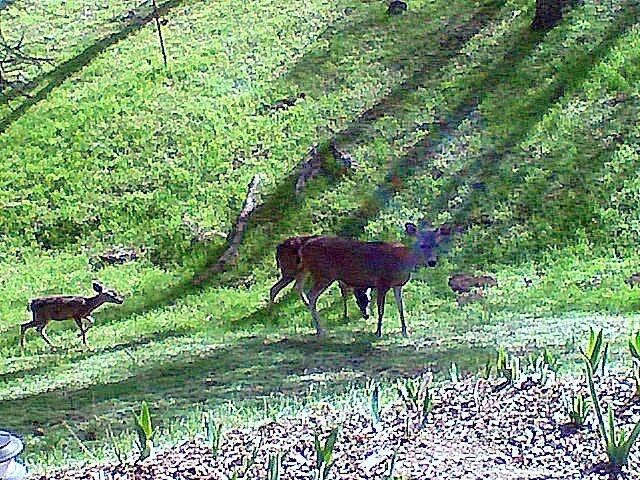 RUN TO THE THICKET, BAMBI! 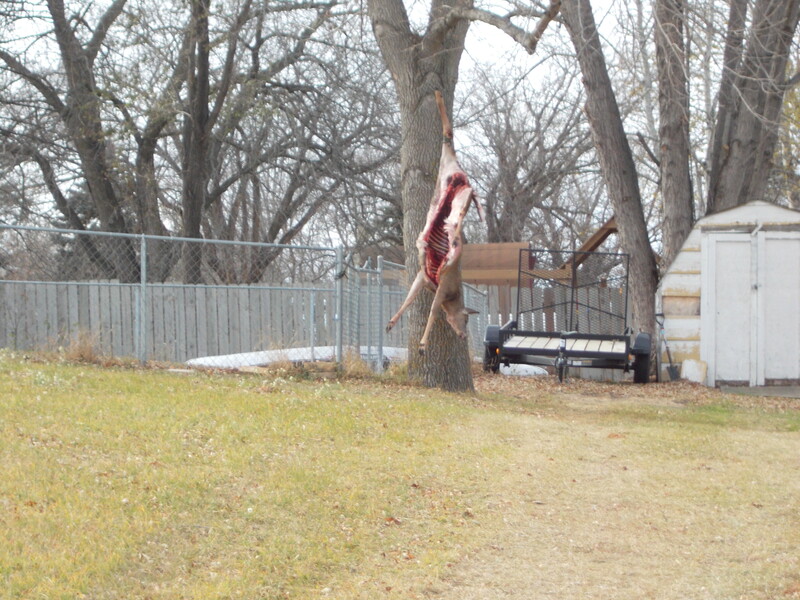 You know that you live in Minnesota when just one day after the opening of deer hunting season, you see the sight of a gutted doe hanging in a back yard just a few blocks from home. This, after wondering why so many neighbors were donning neon orange caps and jackets as they drove off in the wee hours of the previous morning. It certainly couldn’t be the newest stylish fad from J. Jill. But maybe L.L. Bean? As it turns out, there were expected to be approximately 500,000 participants in this year’s hunt. The estimate is that about one in three hunters succeed and with the current one deer limit (unless you are hunting on a private reserve or property) that makes for about 166,666 carcasses. One of which is swinging from a tree just a few blocks away. I remember cousin Chuck reminiscing about the deer lodge on Grandma Pauline’s family property near Lake of the Woods with Uncle Ralph and cousins Ross, Curtis and Doug’ spread nearby. It was family history and the stuff of reverie and tradition. A Minnesota ritual reenacted annually with seriousness and celebration. A nod to the past pioneers who depended upon the hunt. I get that. And respect the nobleness of securing one’s own food. How much better than eating animals who have been packed into food lots, never to know the freedom of the woods, the life lived as intended, wild and free. But, as a child, the second movie I saw (after Dumbo) was Bambi and the grief I felt after Bambi’s mother was shot by the hunter possibly scarred me for life. “The doe was – no she couldn’t be – yes she was – depositing a baby fawn right then and there. I grabbed the binoculars to be sure and by then she was licking it and nudging it into the tall grass where now I could see a second head, the first twin. One year we had a doe that we called “The Bad Mother” because one of her twins was pathetically small and crippled and she tended to shove it away when it tried to nuzzle up to her. I’m sure she, in the wisdom of Mother Nature, knew best because the poor little thing was not destined to live and however much we grieved, she instinctively knew it was best to let it slip away rather than prolong its existence. But it was a heartbreaker. Our favorite twins were likely born just below our lower driveway. I would see their long ears twitching just above the grass as they lay partially hidden and curled up while mom went grazing. As they became yearlings, we noted their distinct personalities and different coloration. 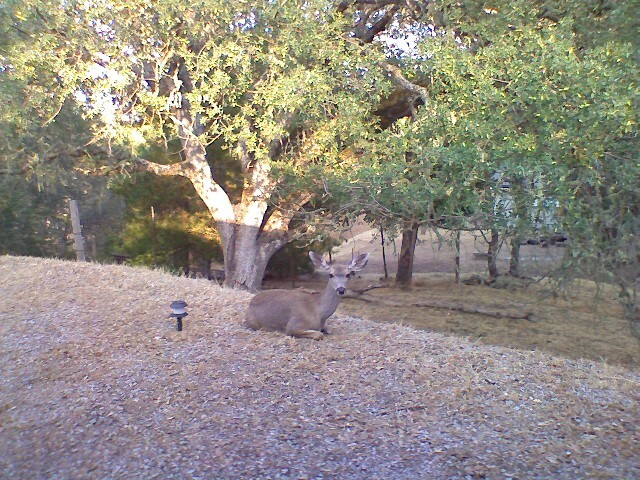 The one we named Buffy was creamy-tan, exceedingly handsome and gently tolerant of other deer. 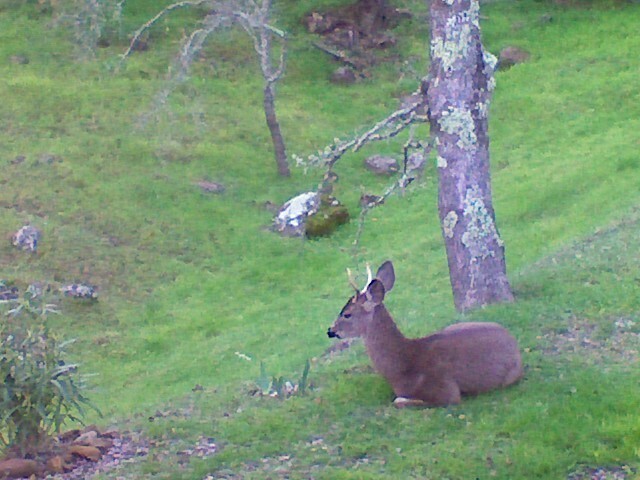 Biff, as the name suggests, was feisty, had a dark streak running down his back and most definitely exhibited “attitude.” I watched him once enjoying some rose cuttings I had thrown on the compost pile when two big bucks arrived. Buffy gave way to the big boys immediately, but Biff never stopped eating as he positioned his small body to block their way. And even as they tried to muscle in, he held his ground. I became so comfortable around the two that even when they were adults, I walked about the property, doing my chores as they nibbled nearby. The does might jump away if I got too close. Buffy would stand placidly and Biff would stare. One time I was kneeling down in the driveway, rooting up a stray thistle and as I looked up I noticed that Biff had a piece of wire wrapped around one antler. The thought went through my mind that I could probably reach out and pick it off for him, but something, some inner voice stopped me and just the next week I read in the paper about the number of people in California who had been gored to death in their yards. It’s been ten years now and I often wonder about the twins but, given the absence of a mighty hunter, there is no doubt in my mind that Biff has become the new Prince of the Forest. Here in Minnesota, without deer fencing around the perennial beds, the local herd plagues my William Baffin rose, chomps the Asiatic lilies, and raids the sunflower feeders in the dead of night. Consequently we haven’t established the same cozy bond. Just yesterday I noticed that the back door had blown open and as I reached out to shut it, a buck bounded past, a few feet from the door. No doubt he saw what I saw just down the street. This entry was posted in Uncategorized and tagged Hunting, Minnesota Life, Wild Life. Bookmark the permalink.